Edited by Mark O'Brien and Kevin Rafter, this study of the Irish Independent was published by Four Courts Press in October 2012 and launched by Eamon Dunphy in the Royal Irish Academy. 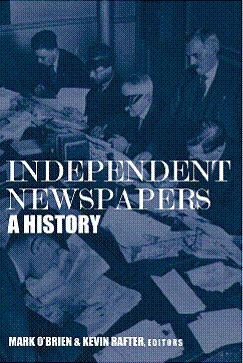 My chapter details the history of the paper during the period 1917-1923; a time when the Irish Independent established its dominance in the Irish market. For over a century, Independent Newspapers has been the most successful media organization in Ireland. From William Martin Murphy to Tony O’Reilly, the newspaper group has long been at the centre of public life, often in controversial circumstances. In this revealing volume, fifteen leading scholars examine the interaction between proprietors and the newspapers, the company’s journalists and journalism, and the relationship between the newspapers and Irish society. Conor Brady reviewed the book in The Irish Times here, while Michael Brophy wrote a review for the Irish Independent here.